Verify and optimize your ultra-low-power IoT design with Rohde & Schwarz test solutions to achieve a longer battery life. Wireless IoT devices serve as a basis for a large number of IoT applications. Battery-powered devices can be easily installed anywhere and are small, robust and easy to use. Depending on the application and use cases, absolute battery life requirements can range from tens of hours for wearables such as smart watches to tens of years for smart meters and environmental sensors. What all these applications have in common is the need to maximize battery life in order to save costs, improve the customer experience and meet regulatory requirements. Designing appropriate hardware and software is key for low-power devices, for example implementing optimal power consumption in active mode, but also deep sleep modes or short startup/shutdown phases. Power consumption also strongly depends on the use of power saving features, application behavior and interaction with the wireless network. Particularly IoT devices that use wireless low-power technologies (LP-WAN) such as LTE-M or NB-IoT require best-in-class designs. They also need to consider all aspects affecting the power consumption of the operational modes and features like PSM, eDRX or CE. 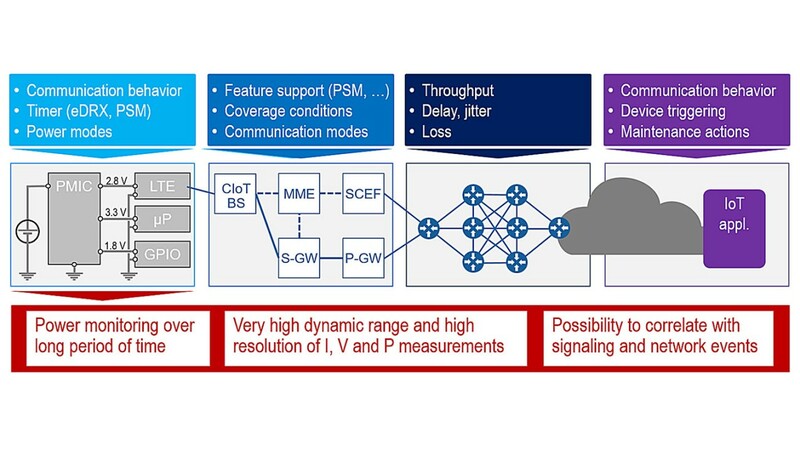 Device and application developers, network operators and IoT service providers require very accurate power measurement solutions with a high dynamic range – from a few microampere to several ampere. There is also a need for long-term measurements covering the different operational modes and various network configurations. The perfect solution for battery life optimization: the R&S®CMWrun sequencer software tool together with the R&S®CMW500/290 network emulator and the R&S®RT-ZVC multi-channel power probe. Deep-dive power analysis and highly accurate measurements on up to eight power channels time-correlated to other scope channels when connected to R&S®RTE/RTO/RTP multi-domain oscilloscopes. Ideal power supply to power IoT devices and other battery-operated devices for testing and allowing easy analysis of actual power consumption.